Monday saw me go to the Hospital as the pain was still a read b$%^&*. The infected area had also stopped reducing, so in accordance with my release instructions from Hospital last week I went in for a check up. Blood tests and movement showed a good infection reduction to that point. The pain was suggested to be bone bruising, but unsure. I was then told to visit again Thursday (yesterday) for another check up. Meanwhile I was told that I didn’t need the sling or to keep my arm elevated all of the time. Put arm back straight back in the sling and keep it upright. Take another 10 days of top strength antibiotics. Visit hospital Ortho-ward again next week. In linked news – Thank you Speedway Squad for not one, but two mentions in episodes 101 and 102. For the first time since I was released from hospital (FOR THIS) I went for a walk with Chris, her Mum and Alex. The last few walks I had been on I noticed about 21 Swans on the lake – by the looks of it 3 generations. These swans were happy enough feeding around me – even the various geese breeds that showed up were in good spirits. The younger ones were a bit over zealous, but in a gentle way. One young swan wanted my attention from behind where I was crouched down, and to do this it stretched around me and gently pecked my cheek – very gently…. I turned around and he just stood there expectantly for some bread. He came over as I put bread down and let me stoke his back and wings… then a few others came over for more of the same. 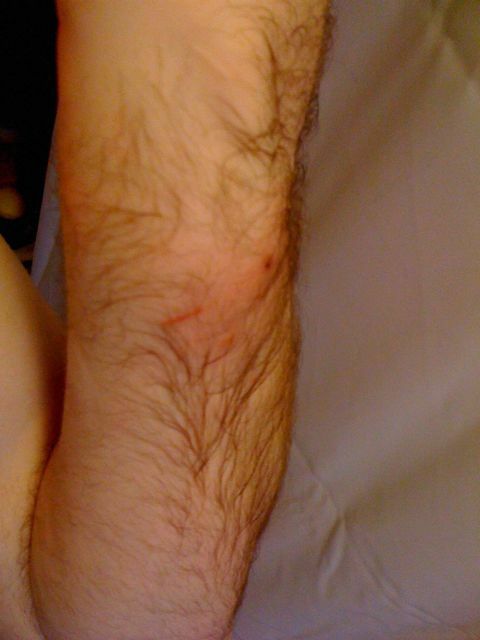 As for the cat bite – I shaved my arm so I could keep check on what is happening. The tendons still ache and the swell is still very painful. 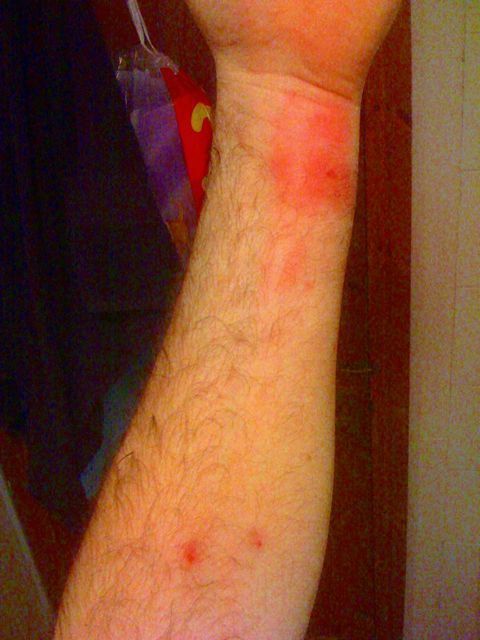 The redness of the infection has reduced, but the reduction has slowed – If it doesn’t keep reducing, then I’m still likely to have my arm cut open and flushed. Hopefully, and if Facebook isn’t being a pain (yeah…. 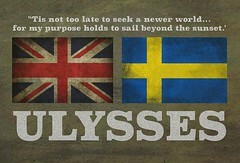 some hope…. ), then this link will take you to the photo’s surrounding my cat attack event and hospital visit. Thanks to all the Tweeters that kept me going through the (continuing) ordeal – and thanks to everyone else on Facebook, Text and in the flesh – Too many to mention. The tweeters I shared my hospital bed with…. Yup…. there’s a lot of them and they all rock! Cheers for the conversations and concern. I feel a very wealthy man for the number of people who stepped up to give me support. Chris goes out to a party. She hardly ever goes out (I don’t tie her up), so I really wanted her to have a good evening. It was fancy dress & she looked great! All the cats have just come in. Before I get to lock the cat-flap I hear a thumping, crashing noise in the kitchen. I go out & find a mean feral tomcat freaking out. The first thing I thought was…. No one will believe the description of this cat! It’s a cacophony of the most evil cats ever drawn on cartoons! It was a cat that, had Sir Arthur Conan Doyle seen it, literature would of had “The Cat of the Baskervilles” in place of that, on comparison, soppy hound. As I went into the kitchen, crouched down & arms out, to keep it in one place & to open the door for it (which would work for most cats), it went nucking futs. It span up and around my left arm, sinking its teeth in again, and kicked out tearing my right hand. It let go & shot into the house. I gave chase & managed to get between it and the stairs. As cats run scared they go flat out with no care… claws out getting grip on whatever they can…No way was this git tearing up stairs and shredding my sleeping little Alex! I managed to herd it back into the kitchen by using a blanket to fence it in. I examined the damage… Shaken & still in severe pain from the bite. I cleaned the wound up. It looked deep, but clean. I covered it with antiseptic cream & dressed it. I wasn’t about to call Chris & ruin her evening. If it got worse, then I’d call her. The bite has swollen a little, but looked mostly like bruising. We took a trip to Frimley Park Hospital to get it checked out. The medic was surprised at the bite radius… and due to the nature of the wound I was given a Tetanus shot. Medic said I’d done a good job with cleaning & dressing it (I should hope so! I’ve just re-qualified as a First Aider! ), and told me to return in 24 hours for a further check up, as bites like this can turn bad quickly. I was given some heavy duty antibiotics and headed home. Wrist is painful to bend. Went for my usual cross country jaunt, but had to leave my Nordic poles at home as I couldn’t use them on the injured arm. Couldn’t sleep as arm was throbbing. Put it this way, try slamming your fingers in a drawer… then keep doing that to the beat of your heart… and do it a bit harder each time so you don’t get used to it. I was running a high temperature, but I put that down to a bug that Alex had just got over. Sleep wasn’t easy. Standing in the bathroom I had sweat running off of me. I still put it down to a cold bug as I had a bad throat too. One of the staff took my wrist & moved it up and down… something I really couldn’t do myself. In two words: It Hurt. Moments later a Doctor came in, saw the red mark (infection) had spread down my arm and said straight away I was to be kept in overnight. The “these things can go bad very quickly” had happened. Thank God I’d done that First Aid re-qualification! As all these symptoms occurred I was mentally aware. I realised I was going into shock. Had I not realised this, then the experience would have scared the Hell out of me. I lay horizontal for a while as my body spun back to speed, then was wheeled away to get my first IV of antibiotics. 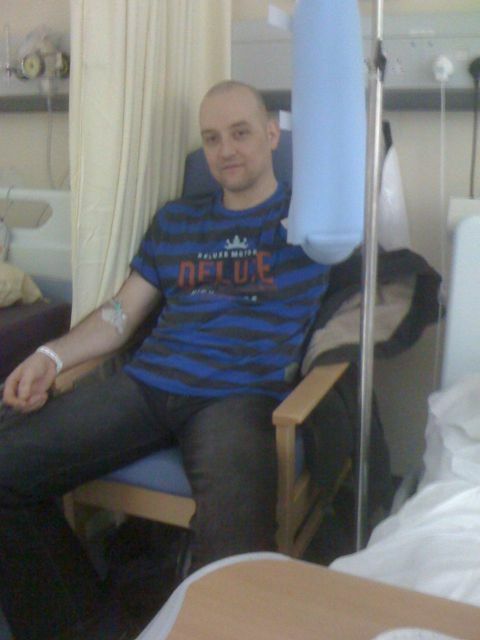 After the first dose I was then placed into the Clinical Decision Unit (CDU) for observation overnight. 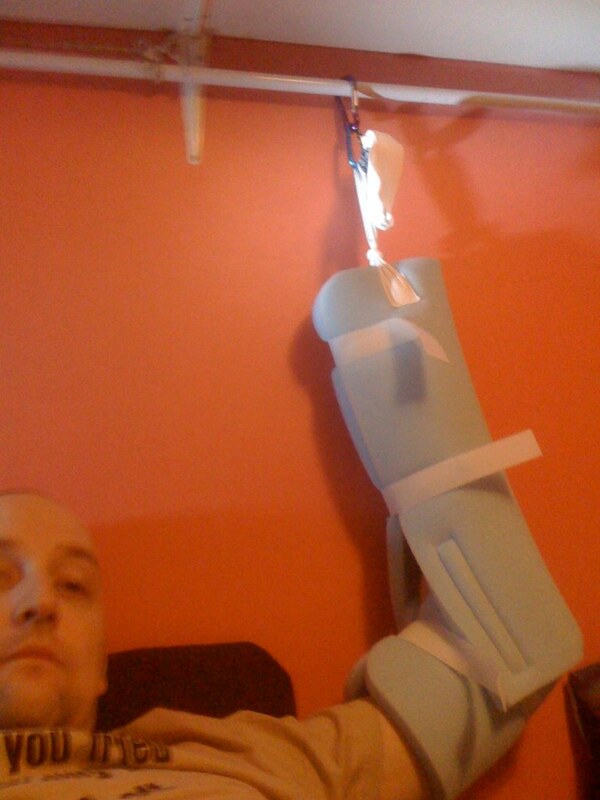 This is where you find me now… Laid up with my arm in an elevated sling to stop the infection tracking any further. A “Bradford Sling”… a sling that I am sure has been banned as cruel and unusual in the Geneva Convention. To all those who have followed this on Twitter and Facebook and given me support and best wishes, I thank the lot of you! You’ve kept my spirit up wonderfully! I’m still in hospital – and feeling quite lucky really. This morning a Surgeon tested the infection and became very aware it may have got into a tendon or two. Straight away I had my food and water stopped. A drip was put in my arm and I was prepared for surgery for the night. From elbow to hand on the back and front of the arm two cuts are made. These are opened up so that the surgeon can flush through and wash out the infection. The arm is dressed, but left un-stitched, for 24 hours at which point it is flushed out again, checked over and stitched. Lots of follow up checks take place. In really simple terms they peal my arm & jet wash it. 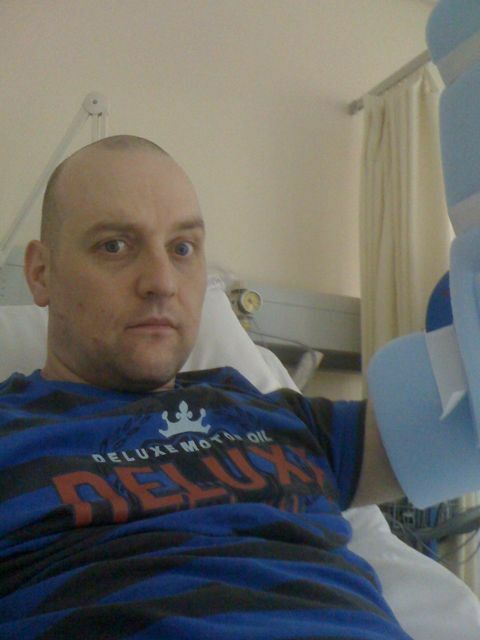 Midway through the day the Surgeon was encouraged by the reduced swelling and slight pain reduction. He was encouraged enough to postpone (in view of cancelling) the surgery. Just had trippy 2 hours due to pain killers. I mean proper trippy…. I realised as soon as I took them that I was off to la la land, so whacked on Pink Floyd: The Wall, and just let it drift over me. Vivid stuff… weird imagery…. Still half out, but had to buck up as Ward Reg just did walk arounds. Surgeons & microbiologist came and checked me out. They are happy with my range of movement and rate of swell reduction. Pain in tendons has reduced & is now more focused around the actual puncture points. Due to this I am to have one more IV antibiotic course and then tablets for 10 days. I also have to keep my arm raised in the Bradford sling still…. even at home, where I’m off to today…. If things start to go backwards though, that operation will be waiting for me. Thanks everyone for your continued support and messages. They really helped keep me positive through the most frightening experience I’ve encountered so far!